Quilt13-001 - Antique 1900s Chimney Sweep Quilt - Check out the great backing fabric! Antique circa 1900s quilt measuring 78 inches by 78 inches. Pattern is called Chimney Sweep. There are 16 blocks, set on point, measuring 10.5 inches by 10.5 inches. Wonderful fabrics include double greens, double pinks, browns, and purples. The quilt is hand and machine pieced and hand quilted at 10 spi with an on point grid. There is a 1.5 inch cheddar border and a 5.5 inch green border...the same print in different colorways. 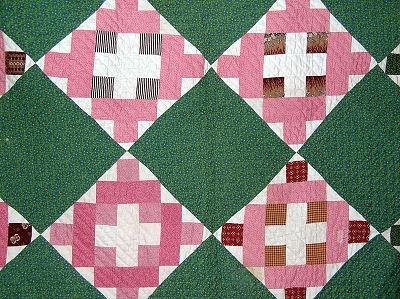 The green in the border is the same fabric in the alternating squares and setting triangles in the quilt. The back is a purple and brown print cotton fabric. The edges are finished by .25 inch double pink fabric binding applied by machine to the front and by hand to the back. Condition is good. There are several small spots, and one small hole on the top that does not go all the way through to the back.